Did you know that properly using a programmable thermostat in your home is one of the easiest ways you can save energy, money, and help fight global warming? A qualified programmable thermostat helps make it easy for you to save by offering four pre-programmed settings to regulate your home's temperature in both summer and winter - when you are asleep or away. You'll also have the added feature of controlling your home remotely. The average household spends more than $2,000 a year on energy bills - nearly half of which goes to heating and cooling. Homeowners can save about $180 a year by properly setting their programmable thermostats and maintaining those settings. 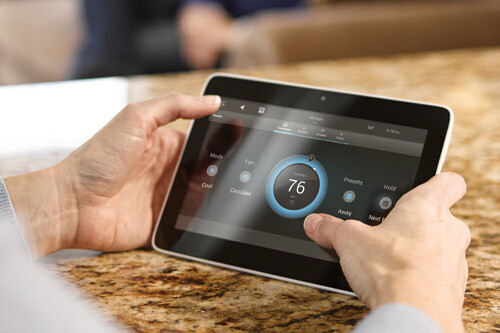 The pre-programmed settings that come with qualified programmable thermostats are intended to deliver savings without sacrificing comfort. Depending on your family's schedule, you can see significant savings by sticking with those settings or adjust them as appropriate for your family. The key is to establish a program that automatically reduces heating and cooling in your home when you don't need as much.